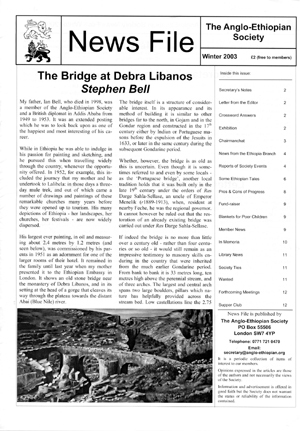 The main printed publication of the Anglo-Ethiopian Society is 'News File'. It is issued free to members three times each year (Spring, Summer, and Autumn/Winter). Many general articles, reports of Society lectures, and reviews from past issues of News File are now included on the website. One big advantage of having these on the website is that many of the photos can now be reproduced in colour; more photos than could be included in the printed version are also sometimes provided. Back issues of News File (from Spring 2003 onwards) are available at £2 each (post free). Over the past two decades the Society has also published a number of 'Occasional Papers' covering a wide variety of topics.